It is the last day of our focus on Peace for the month of September. We close the month considering the many thoughts, the many actions and the many results we may have considered and created in the month. It feels good to have at month’s end, a look back to realize what is possible when we use intention or have focus. It gives peace of mind to know that what we start out with can have achievement when we take action to make it so. It is like the daily walk, having one foot in front of the other begins the process. Continuation allows us a bit more investment and expansion and soon we are strolling along with all kinds of extra benefits we didn’t think possible. We all know the struggle of non accomplishment that is often rifled with the emotions of guilt and a host of various excuses as to why we may not have accomplished something we very much said we wanted. There is usually something else at work that derails us and to know peace is to go beyond the struggle and the resistance into the place that simply honors what is true. It allows us to get above our story and redesign with simplicity and honesty that which suits us. All month may have been a bit of the resistance in one small way or another, though each is a lesson of learning and like anything we practice, we play the best game in the end. So do consider from the month of learning and discovery just what it is that was successful. What ways can we evaluate our production of peace? Count the blessings, the wins and all the things we may be grateful for and those are the small moments of peace. We may be surprised to find how many there are when we stop worry about what we didn’t do. Peace is ever present and ready for our use, though to use it on another or for an experience, simply become the very aspect of it ourselves and we will have the best education ever. Harmonize, blend, balance and surrender… peace be with all. 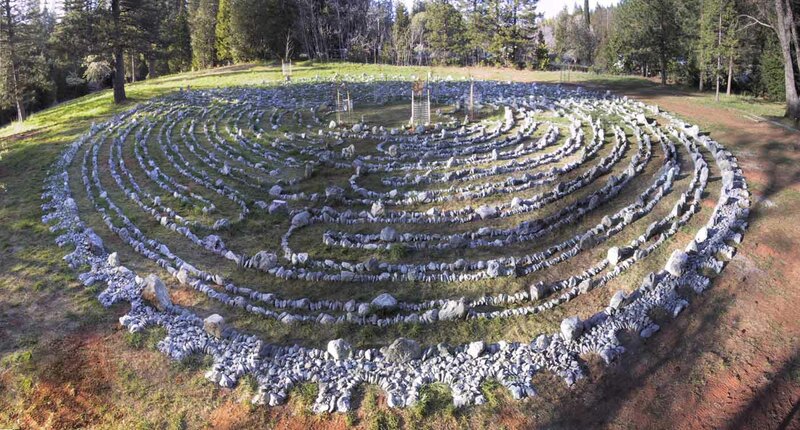 Enjoy the music and video of the building of the Abode of Peace Labyrinth for the Yoga Retreat Center by David Blonski. 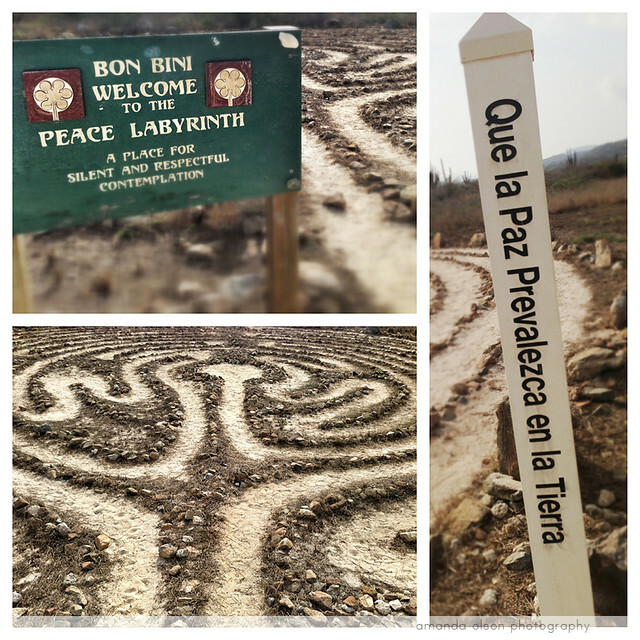 This Peace labyrinth was a gift to a little unused community garden. It added a presence to an underutilized area and became the jewel in the center. Now the entire garden development is used for community gatherings such as theatre, concerts, yoga and movies. What was unnoticed became a marker for the community and in its center, the labyrinth is an accepted tool of growth. Take a look around on your walk today, what lies dormant that could be spruced or polished enough to find its way to a new or more productive use that would be for the benefit of the many? Memorial Gardens, Relaxation centers and quite little grotto’s tucked away from the madding crowds are all places that might feature a labyrinth. The settings are designed with peace in mind and the labyrinth is such a unique tool to rediscover the peace in every day. From the hurried and often stressful places of hospitals and medical institutions to the harmonizing of the word in a religious setting, gardens are a place to plant ideas. A garden is where you can nurture the soil and stimulate growth. It is a place to tend and to add your tender care and love to produce self care along with the budding blossoms and foliage displays. The Kincardine Peace Labyrinth is set in Geddes Environmental Park and its chalice design allows the walking path to be strewn with flora and statues with the message to walk in peace. It’s message of what is natural is in step with the environmental theme and the Peace Vigils and workshops continue the education and environmental compliments for more to come to know the wisdom of the labyrinth as natural and grounding for the Earth. This is an example of enhancing and using natural settings to continue to teach us how to be better humans and live within harmony with the Earth and each other. Planting our own seeds as we walk daily, no matter the consistency or construction of our labyrinth, can yield us much by the end of the walk and replicated when concentrated and cared for over the month and years too. Some of us use canvas or finger designs where the act of symbolically planting an idea, noting in a journal or creating a routine to cultivate might be a helpful way to develop your own internal garden. In this there is much creativity where we are not limited by instruments or spacial concepts and designing a garden of the mind or soul can take on infinite possibilities. In freedom there is the infinite… rejoice in the peace that brings freedom. There are a number of labyrinths noted as “Peace Labyrinths” now within the educational setting. Perhaps it allows for the conflicts to become the lessons or finds its way to be utilized as a tool for reflection and then again it just might be the meditative or spiritual path that opens the door to insight, creativity or balance. At St. John’s Prep in Massachusettes, this unique design mostly highlights the idea of peace, meditation and spiritual growth. . The mosaic steppingstones that guide your way are based on religious and spiritual symbols from around the world and throughout the ages. At the center of the path is a dove representing the peace we search to find in ourselves and in our world. Experienced together, these symbols reflect the spirit of inclusion, understanding and diversity that are the ethos of the school. We can talk about peace, though when we put the idea out there to not only be witnessed, but experienced uniquely and collectively, then we are the bearers of peace. For today, allow the walk to bear the fruit of what you put out there. Tis Thursday at Tigh Na Mara Resort on Vancouver Island and the members of the Labyrinth Society have gathered. Some have come in earlier this week and are part of excursions and events that highlight the community and prepare members with opportunities that are related though outside the purview of the conference. This year’s theme is Labyrinths for Global Healing, Landscapes for the soul. A Kick off reception and welcoming events took place in the late afternoon after registration, including our own 365 Club Reception for members. Mary ended up leading the way sharing thoughts and ideas and asking input from members for the upcoming year. After dinner the fabulous words and metaphors of Keynote speaker Carol Matthews enlightened and informed members of the ways in which the labyrinth works in healing and transformation. Carol’s talk reminded us that sometimes there is a maze in our labyrinth and that the road is not always clear ahead when we have major upsets or disruptions of life, though there is a path to take. On it there may be no clear direction and times when it feels as if a maze has taken over the easy path of the labyrinth. Those are the times when the great growth can occur if we do not dismiss the path we are on as unrelated or insignificant simply because we don’t choose to accept it. When we do however, we find our courage and strength and sometimes steps toward that next direction and lots of opportunities to reconsider our relationships of faith and trust. Carol Matthews, by the way was awarded the Queen Elizabeth 11 Diamond Jubilee Medal and the Order of the B.C., which is the Province’s highest honor, recognizing Carol’s dedication and commitment to her local community. The list that speaks of Carol’s accomplishments and achievements is long, and it was an honor to hear her very compelling experience of the labyrinth. Following the impactful speech, members found their way down to the beach where the full moon lit the way for storytelling, labyrinth walking and conversations by cello. 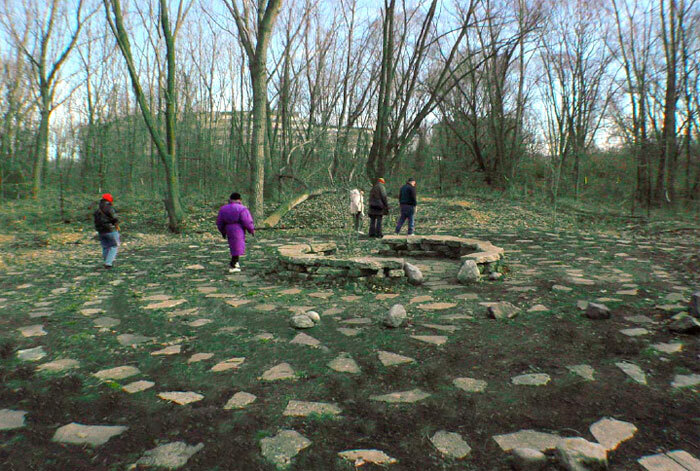 The Turtle Peace Labyrinth was constructed from concrete debris found on-site at the Teaneck Creek Conservancy. To create the labyrinth pathway, volunteers relocated the pieces of rubble by hand from their original location on the banks of the creek to the site of a former ball field (photo courtesy of Richard K. Mills). The element of water, marshes and wetlands are natural habitats for turtles. As a totem animal the turtle assumes a role of peace in our lives reminding us to walk the natural path of the Earth and to realize the benefits of water flowing. In our minds, our physical bodies and our souls, allowing that which makes up most of who we are to be at ease and enjoy the strides of life. The Turtle reminds us to take a break from the busy days and look around or within. Traditionally, the turtle is symbolic of the way of peace, whether it’s inviting us to cultivate peace of mind or a peaceful relationship with our environment. There is a lot of heart and soul in the Peace Labyrinth at Park Rose Community High School in Portland, Oregon. The path way leading up in full of messages and the gateway that is pictured here in the shape of a turtle, symbolizes Mother Earth. In building this as a grounding for the community, a community groundskeeper and volunteer activated six students to inspire initiative in the community to take time for themselves. “We realize that we have all come from a direction… and are all on the same path… even if we are facing different directions or moving at a different pace.” Sharon DeWitt, Community Groundskeeper PHSCC. The harmonizing of all the differences reminds us that we are all the same in many ways and where there are differences among us, there is an opportunity to find the unique peace. The Peace Labyrinth and Peace Pole of Aruba’s Alto Vista Chapel. Alongside numerous labyrinths we can also find Peace Poles planted. The association with the meditative nature of the path of a labyrinth and the idea of peace is joined together as when we relax, reflect and go to our known source, we discover harmony flowing more naturally. We can get in touch with what peace is all about. Peace Poles are sometimes set in the center of the design and other times set off in a designated spot to honor the concept in a special way. The poles have inscriptions that have many languages bearing the message of peace. The concept of Peace Poles comes from the World Prayer Society and is the manifestation of Masahisa Goi, a man who made it his life’s work to spread the message “May Peace Prevail on Earth” which is the inscription that is entered in many languages on each pole. He started this mission in 1955 and it continues today finding partnership in many gardens and places of retreat and reflection. Consider adding a Peace Pole to your yard, community or organization’s labyrinth and note if it makes a difference in the way you walk or your purpose. Even if you included a simple token that represented the message, would it help to realize harmony? Walk on it and explore the possibilities of peace. While we move through the month and focus on the inner knowing and wisdom of peace, we walk with slow and silent meditative steps. Sometimes purposeful on the intent of discovering the presence of peace within the universe we do not want to disturb it with the extra noise that our unconscious being might make at any given turn. With awareness we discover that peace isn’t about being quite, and with a bit of joy we might fling our arms and whoop it up in excitement of this understanding. What then is the peace we ask? Is it the having or is it found in the not having? Is it something we have to make a process to find or is is found in the simple epiphanies? Awareness or the idea of being awake and present to a thought, idea or a feeling is the first step. It takes a good idea and then makes the action necessary for the discovery and enlightenment. With awareness we can be more direct about what peace is and what it isn’t. Where there is resistance, peace can usually be found on the other side of it. Though there is peace within the resistance too. It is everywhere just waiting to be discovered. Walk with the obstacles to discover the peace within. With confusion or clarity, both will lead to Peaceful endeavors, though one is more direct. Have you ever noticed that we tend to think of the smooth and clear path as more favorable, though we learn the most from the bumpy and obstacle laden ones? We are ever in a flux of change and movement as the world does not stop its revelations because we are not ready to spin with it. Though most know the Earth is revolving, how many stop to find stillness? It is in connecting to the movement that we may begin to realize the idea of what being in the flow of things is all about. According to Andrew Fraknoi, the Astronomy Chair at Foothill College, the Earth is actually moving at a speed of 1,000 miles per hour at the equator in order to move around the sun and stars in one 24 hour revolution, which proves that even if we think we are sitting still, we are moving. The good news is that speed slows down a bit as we move away from the Equator and with gravity it puts in perspective about why we don’t actually notice the movement. Let that be a note of inspiration if you ever think you are stuck. Simply let go of your perceptions and feel the flow of the universe to get in relationship with movement. Stick with the idea of motion and begin to appreciate the confusion as on the outside it may appear a mass of contradiction, though truly it’s only a series of entanglements waiting to educate and stimulate a deeper sense of knowing. So whether the story that is unfolding today is clear and understandable or a confusion waiting to unroll, enjoy the flow of the step by step process that unwinds to bring the greater gifts to light. Finding that the clarity is at one end of the road and the confusion at the other is about movement and the journey is about what brings us to realize that peace is everywhere.